This passage was written by Kouzaburo Yoshimura in 1942. The contemporary of Ozu, he had directed such popular films as “Danryu (暖流, 1939)” and “Nishizumi Senshacho-Den (西住戦車長伝, 1940)”. For example, his “Danryu” is mostly set in western-style rooms and interiors (the story takes place in an ultramodern hospital and high society mansions), but there are a few scenes in Japanese-style rooms, which immediately present this problem of frame compostion. The three frames below are the his solution at the time. The actress (Mieko Takamine) recognizes the guest visiting her house, and kneels down to greet him. By panning down to reframe her, the camera (almost) always captures the character in full during the movement without distracting viewers as much. His above observation was about Ozu’s “Brothers and Sisters of Toda Family (戸田家の兄妹, 1941)” released in the previous year. Yoshimura was much impressed by the method how Ozu solved the problems of capturing Japanese style of living on standard aspect ratio frame. “There Was A Father” is the turning point in Ozu’s cinematic style. This film established the signature Ozu style. Throughout the film, the camera is consistently positioned at around 30 to 40 cm above the tatami. The compostions are dead-on, no slant angles. Two rooms/fusuma combination is the basic set for the converasation. Pillow shots became critical components of the film. Most of all, the consistency of these stylistic elements is the key. There were many instances of these cinematic devices in use in his previous films. The low position of the camera is already evident in “Chorus of Tokyo (東京の合唱, 1931)”, static frames are almost perfected in “The Only Son (一人息子, 1936)” but the consistency is fully realized in this film. In the previous 6 minute segment, there is the scene in which we can see how Ozu effectively turn Yoshimura’s problem into his device. When the father comes home, the maid greets him at the hall and tells him his son has arrived. The father acknowledges, and his voice turns bright, delightful tone. During this exchange, we do not see the father’s face. It is framed only to cover the maid kneeling on the floor, and the lower body of the father. But we don’t have to see his face. It is left to our imagination to feel his delight. During the conversation in the room, the son stands up and move to the next room to give the prayer to his mother’s shrine. When the father and the son are sitting on tatami, engaging in the conversation, the camera frames the two in full. Then the son sets in the motion to stand up, there is a cut followed by the medium length shot to cover two rooms and the whole body of the son. This transition flows so naturally, we didn’t notice the “problem” about this process as Yoshimura has described it. This style of composition was not Ozu’s exclusive license. 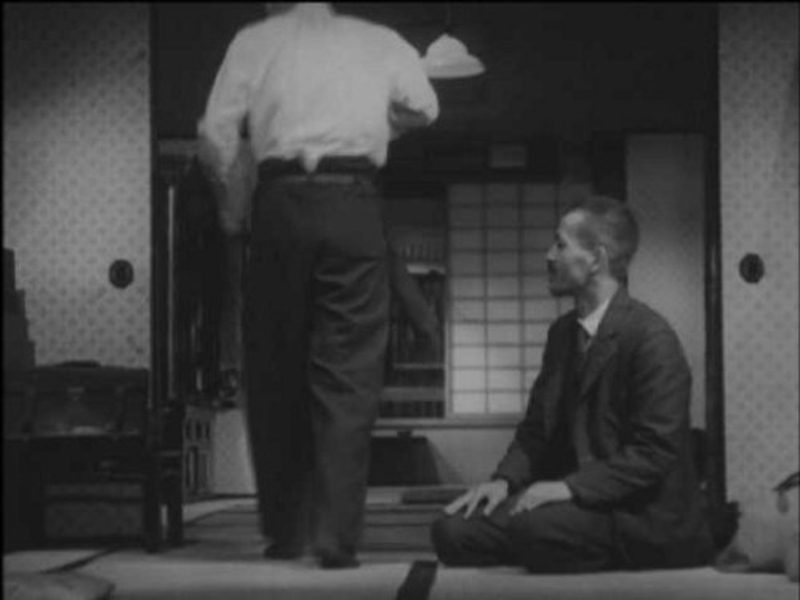 In fact, many of the Ozu’s contemporaries utilized low positioning of the camera to frame Japanese-style rooms. In “Kanzashi (簪,1941)”, Shimizu uses the fairly low camera position to compose several figures in adjoining two rooms. By placing the old man sitting in front of Go in the foreground and several standing figures in background, the composition and actions in the frame is well balanced. In many cases, the fairly low camera positions are called for simply to frame the figures in balanced look. Therefore, in most cases, its use is less consistent, resulting in the variety of framings in one passage. Here, in “Ai Yori Ai E (愛より愛へ,1938)” directed by Yasujiro Shimazu, Ozu-like stark low positioning of the camera is immediately followed by the much mundane composition of the same scene from the higher camera position. This destroyed the tension created by the first compostion. On the other hand, consistency is critical in Ozu’s approach. He carefully times the every movement of the figures in the frame to calibrate the scene. The cut starts with the figure goes back to his place and sitting down. In turn, Shin Saburi stands up to fill the frame. This slight translation of the composition occurs so naturally that we do not notice the “invisible hand” that composed this frame. In this sense, the whole reunion segment is amazing exploration in frame compostion, figure movement, and story telling.